Hypnotic Glamour Beauty Blog: Pink & Gold Wire Baskets from Walmart! 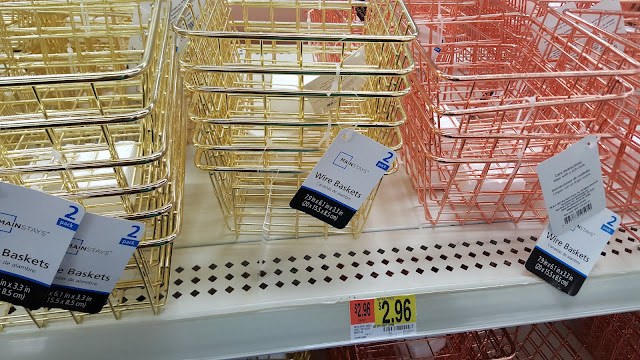 Pink & Gold Wire Baskets from Walmart! These baskets come in a set of 2 for less than $3. An amazing deal. They measure 7.9 in x 6.1 in x 3.3 in and are perfect for storage solutions or just for home decor! Use them on your desk to store supplies, vanity to store makeup, bathroom counter or dresser to store beauty products. There are really endless uses. These are only sold in store but the best part about shopping at Walmart is you can order on line and pick up in store. Online, they also have a set that includes a paper towel holder and a utensil holder. If you have any of these baskets, let me know how you use them in the comments below.